Your Critical for Selling Beyond the Farm Gate. Click to download this PDF. Before you dive right in, please download The Critical Path to Selling Beyond the Farm Gate. The form will also give you an idea of the outcomes from each module. Selling Beyond the Farm Gate is designed to meet the needs of producers who are expanding from direct market sales into sales to retail and distributor accounts. You may be expanding your product line with new items, exploring new value-added items, or increasing the volume of what you already produce. You may be adding a few new markets where you are not meeting the customers directly, or you may be re-orienting your marketing strategy to sell through distributors. You may already know what new marketing channels you plan to approach but need to develop marketing materials and set prices. Or you may be in the exploration stage. Each situation is unique; the modules are designed to be flexible, to meet the needs of producers at different stages and with different goals. The Selling Beyond the Farmgate course is a project of the Local Food and Farm Co-operative network (LFFC) with input from AMI’s and LFFC’s extensive network of partners. The modules include resources for you to develop your plan, as well as videos from producers who have gone through similar expansion, and experts with specific input for different issues. The six modules follow the “Critical Path” to selling beyond the farmgate. 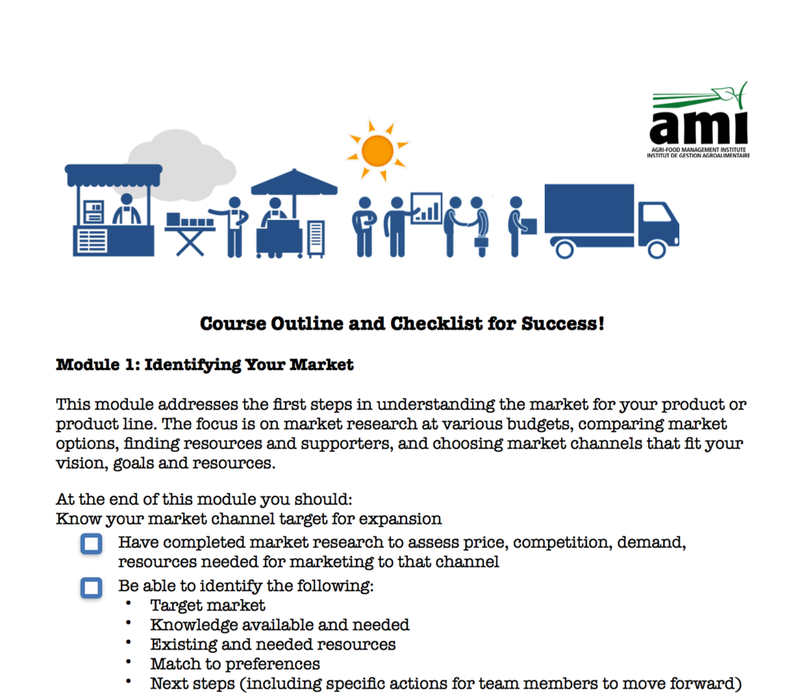 The modules present the information, input from experts, and decision-making strategies necessary for participants to choose appropriate marketing strategies and goals that fit their farm business values and aspirations as well as their own expertise and experience. The training includes worksheets for participants to work through all the elements of well-informed decision-making, and to assess various scenarios to make their expanding business a success. The Critical Path is summarized in the graphic above; you can click on the titles [Wayne, please link these] to enter the course at any stage; note however that the course builds on the initial visioning stage (part of Identifying Your Market) so it is good to start there. You can see the full Critical Path here. The information provided in the Selling Beyond the Farm Gate resource is intended to inform users about the planning process and of beneficial business management practises. Our resource is not an exhaustive financial analysis of your business and we recommend you work with a financial advisor before making any significant investments. Opinions shared in the video components are that of the speaker alone and are not necessarily reflective of the Agri-food Management Institute's values or opinions.